Amy's Creative Pursuits: Chenille: A Fabric I'm So Happy To See Return Again! Chenille: A Fabric I'm So Happy To See Return Again! Trends come and go. Some trends we hope to never see again, and others we don't want to give up. Chenille sweaters were one of those trends for me. I love the look and feel of chenille. It's so soft, cozy, and warm. When it was really "in" I purchased every chenille blanket I could find and put one in every room of the house. I owned several chenille sweaters as well. But, like all good things, chenille eventually came to an end. So my chenille blankets were switched out to fleece or fur, and my sweaters back to normal yarns. But now, chenille is back! And I for one am loving the return of this beautiful yarn! 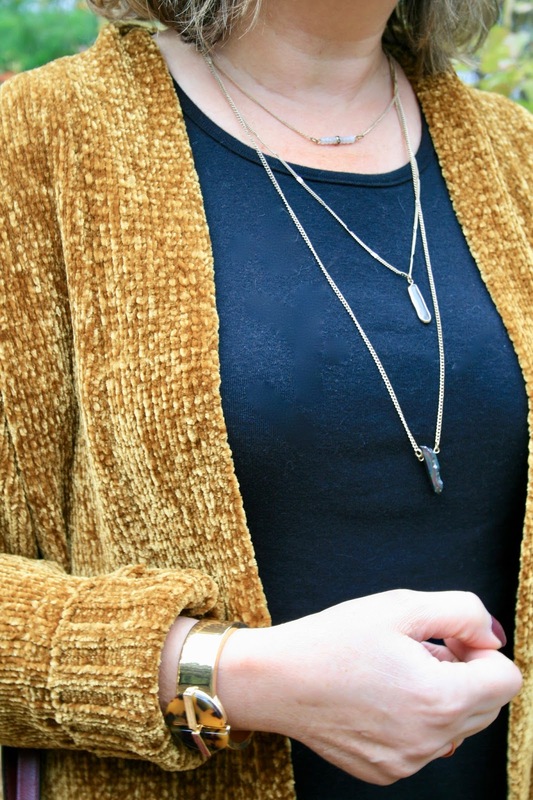 You've probably been seeing these gorgeous gold cardigans everywhere in Blog Land. 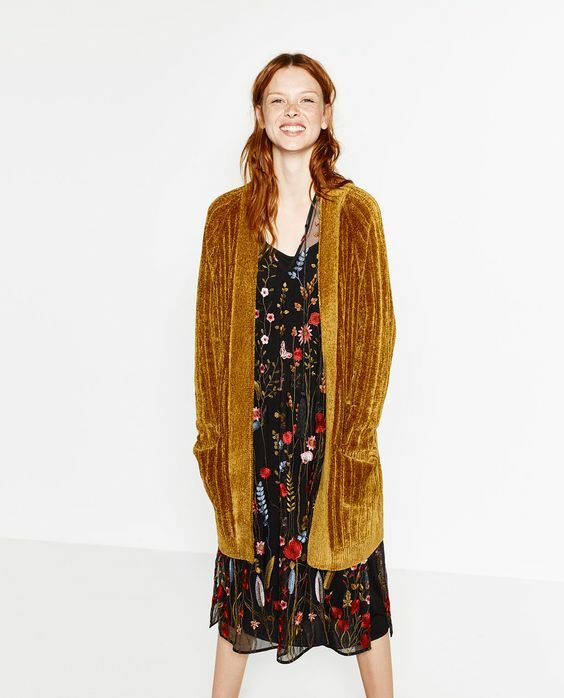 I was SO excited when I was walking through my local JCPenney and spotted this Arizona Long Sleeve Chenille Cardigan in the Junior Department. It was a steal for $24.99! Is this color gorgeous or what? JCP calls it Ochre Gold but most bloggers refer to it as Marigold. I just love the length and the iridescent quality to the yarn. And yes, it's as soft and warm as it looks! I wore a old sleeveless black tank underneath the sweater, skinny jeans, black booties, and I carried a burgundy bag. 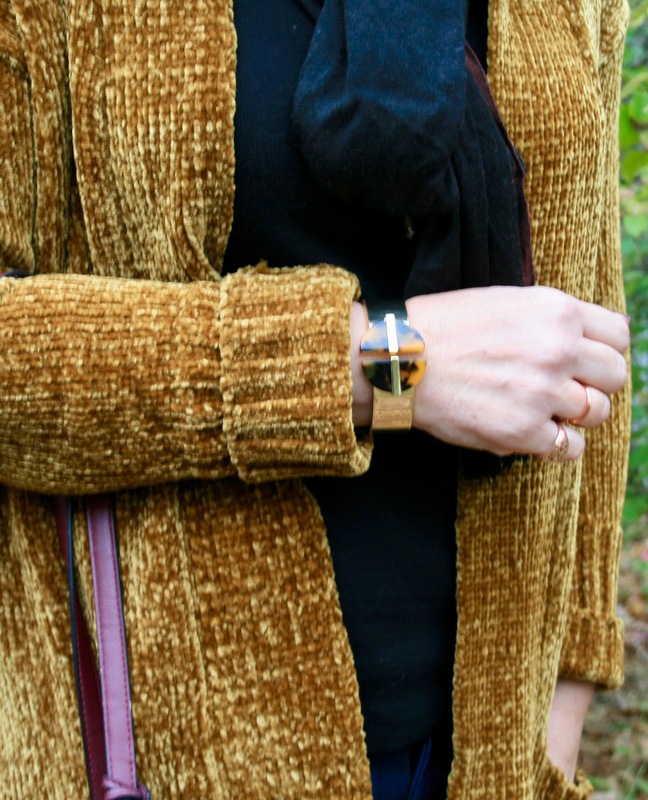 My new tortoise shell bracelet I picked up on clearance for around $3.00 at JCP went perfectly with my new gold chenille sweater. I also wore a black/rust scarf as it was cold this day. Underneath the scarf I wore a three strand stone and old necklace in case I got cold and removed the scarf. But it was so cold, I never did. Here is the look without the scarf. I think it looks much better with the scarf, don't you? I wore a high heeled bootie by Liz Claiborne (old). It's important to note that these type of sweaters can make you look heavy and frumpy. I find it's best to keep what I wear underneath body skimming, and to also add a shoe with a bit of a heel. Here are some other cute chenille cardigans I found on Pinterest. I love this color-block one. 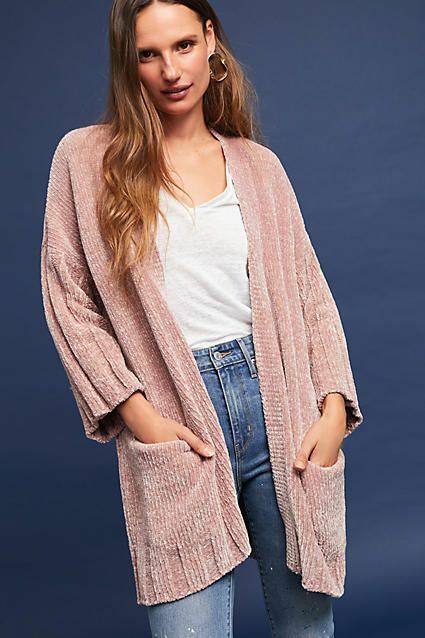 Isn't this pink chenille cardigan so pretty? And finally here is a olive green one worn with skinny jeans and black booties. I think the hat and choker are the perfect added touch! So what about you? Are you as happy as I am to see this fabric back again? I'd love to hear from you! You look so stunning! Love that coat!!! 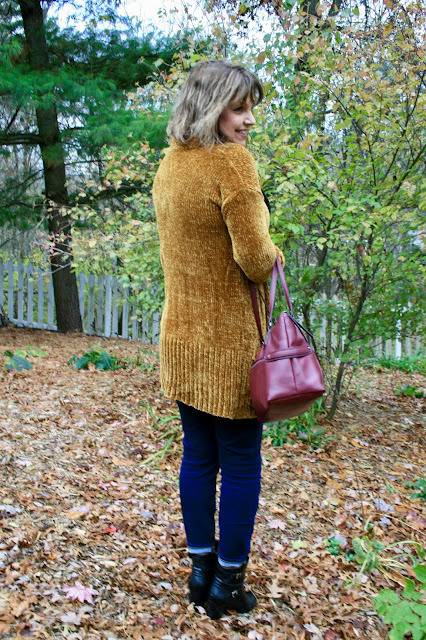 Until I saw the pockets, I thought this was my Ochre (mustard) Loft Chenille sweater which I have been wearing all this season. You found this great dupe at JC Penney. They need to start paying you. Such a cute, cute outfit! I love chenille and I am glad it is BACK! Yes, there are so many styles of this sweater out there! I'm seeing it everywhere! I have been amazed at out how fabric is back! I love this color cardi, and it looks so good on you. Me too! And I'm so happy about it! Thank you! This fabric is the softest and so cozy! It's fun that it's back in style now! What a gorgeous sweater! 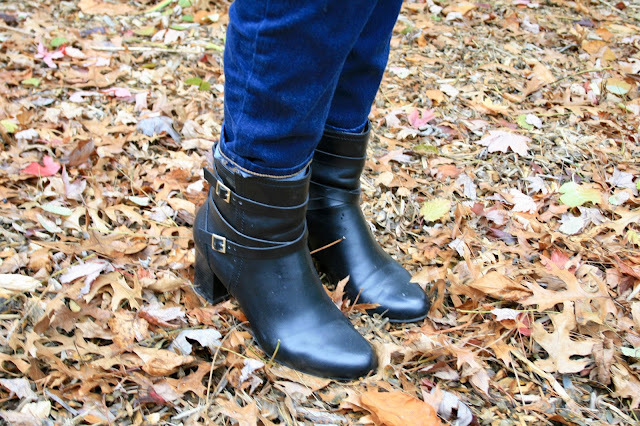 It's perfect for Fall! The sweater looks so soft and cozy! Gorgeous fall color too. I used to have a few chenille pieced "back in the day" but haven't bought anything new yet this time around. Gotta go shopping, I think my daughter would love a chenille sweater for Christmas! Thank you and welcome to Blog Land! I'll be sure to pay you a visit. Oooo, so many pretty options! Love the warm color of your cardi but those pink and olive choices are also right up my alley. Congrats on your grandbaby's dedication. Loved the pictures. Thanks Leslie! Your comments on FB were so sweet! Thanks Mary! I'm sure you will get a chenille sweater soon and I can't wait to see it! Love this golden mustard sweater + you may have convinced me to check out chenille for myself. I am definitely happy to see this fabric coming back into style! It looks so comfy, and would pair so nicely with a wide variety of outfits. Plus, the color of your cardigan looks gorgeous on you! Chenille is sooo soft! I'm sitting next to a chenille pillow as we speak :-) I can imagine that a chenille cardigan would be so comfy! 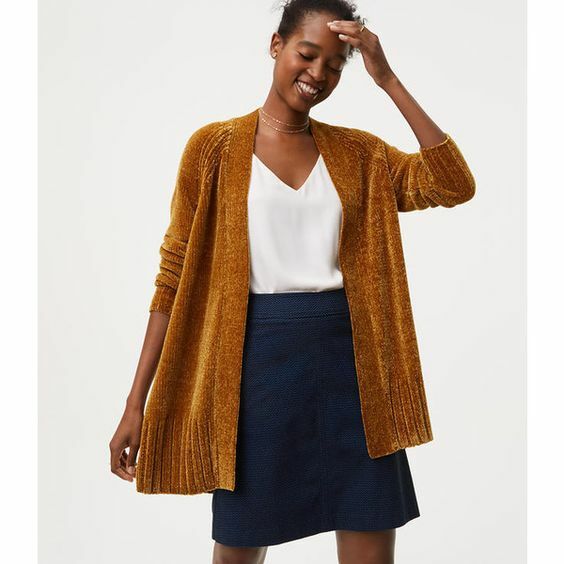 Yes, when I'm wearing this cardigan I feel like I'm wrapped up in a chenille blanket! Thanks for coming to the Top of the World Style linkup party. That cardigan looks really cozy. 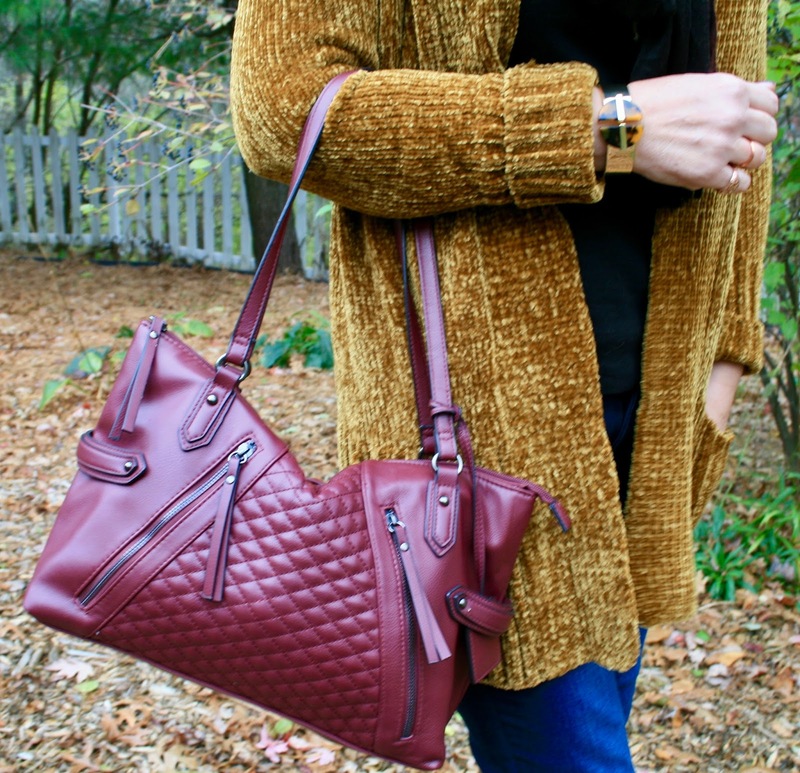 Great velvet knit! love the chenille cardi, so cozy looking and your scarf looks great Amy with this color palette! 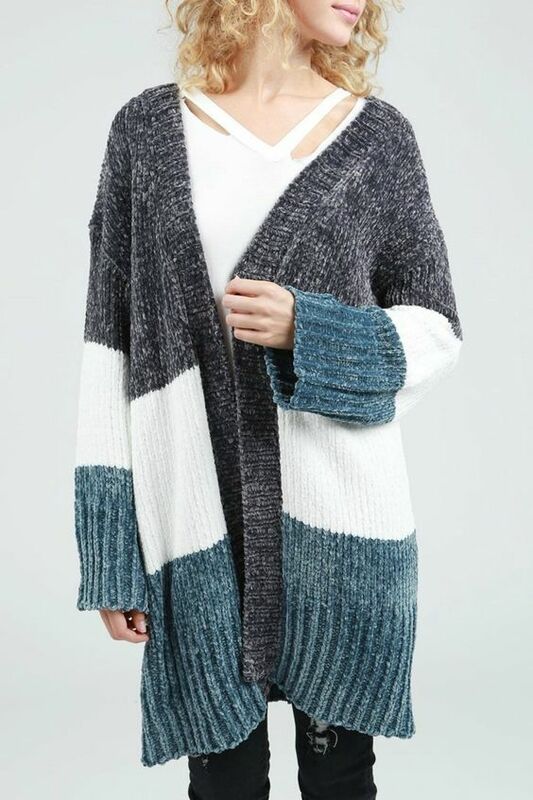 Gorgeous cardigan! It looks so soft and cosy and I love the colour! Thanks for linking up!